In late Summer 1644 Donnington Castle, a key Royalist outpost protecting Oxford, was besieged by Parliamentary forces. King Charles moved his army to relieve the garrison prompting Parliament to merge their three field armies and converge on Donnington. 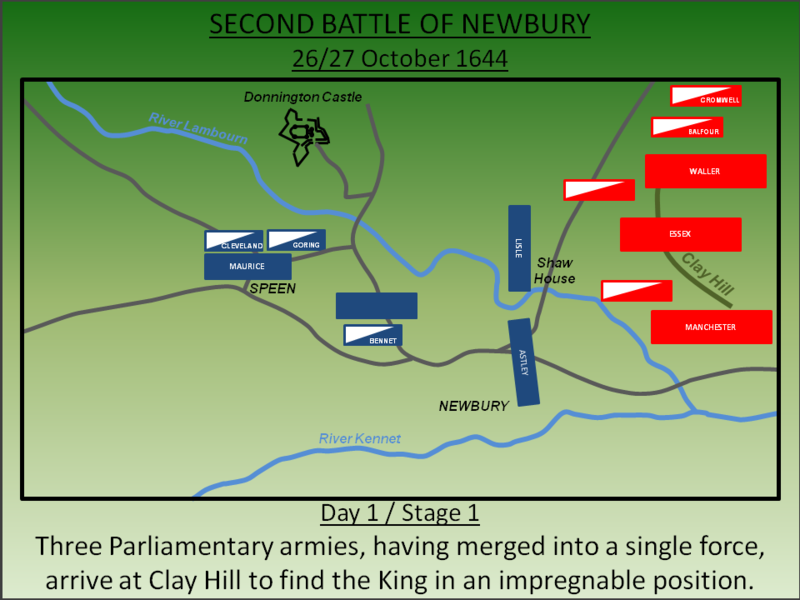 The Battle of Newbury (1644) should have been an easy victory for Parliament but, hampered by its three Generals, ultimately ended in failure. 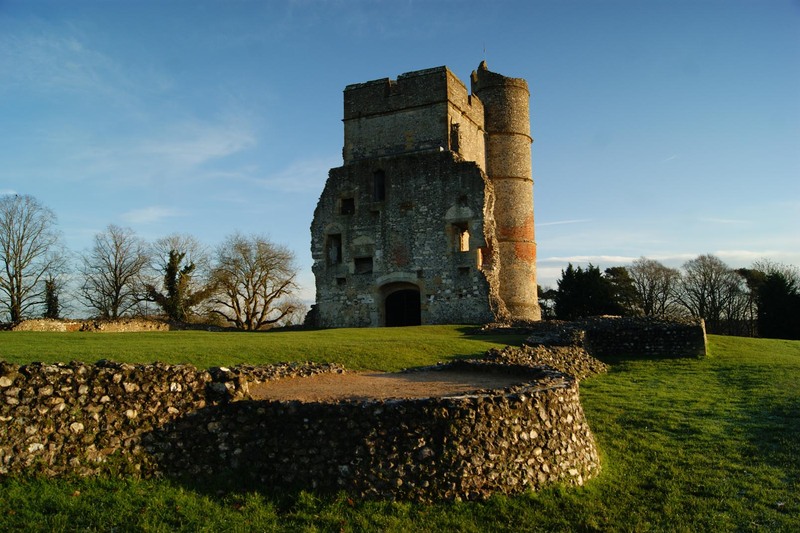 Donnington Castle was captured by the Royalists in late 1643 in the aftermath of the first Battle of Newbury. With nearby Oxford serving as the Royalist capital for the duration of the First Civil War, Donnington became a key outpost for the protection of the southern approaches to that city. Substantive earthworks were dug around the structure converting the small medieval castle into a formidable fortress. The relief of Basing House, rather than Donnington, was the King's primary concern as the shortage of supplies there were critical. However Parliament had decided to merge its three armies into one huge force and they had rendezvoused at Basingstoke. Nearby Basing House was now an impossible target for the King so instead he turned his attention towards relief of Donnington. The Parliamentary force, plagued with leadership issues as the three Generals refused to recognise a single leader, moved towards Newbury to intercept him. 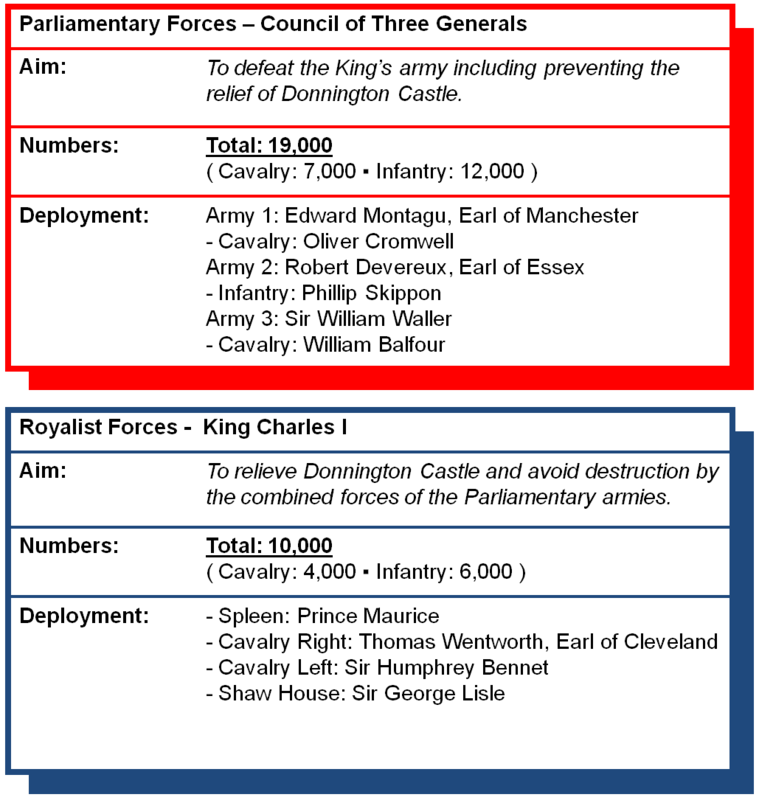 The combined Parliamentary forces numbered around 19,000 - almost double the size of the Royalist force. The Parliamentary forces arrived in the area on 26 October 1644 and spent the remainder of that day deploying. The battle itself was fought on 27 October 1644. 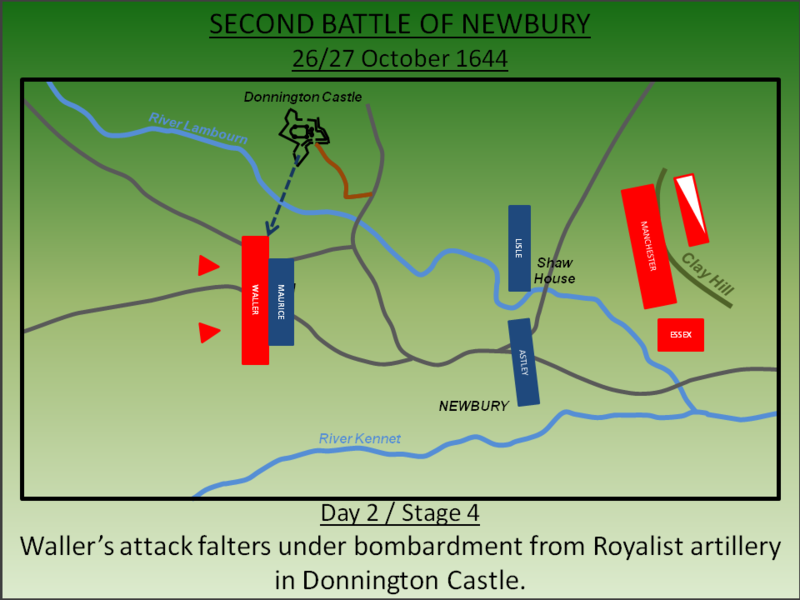 The King's forces had established themselves in a strong defensive position adjacent to Donnington Castle. They were protected to the south by the River Kennet, on the east by the River Lambourn and to the north the powerful guns of the castle covered their position. A frontal attack on the Royalists seemed futile so the three Parliamentary Generals agreed one of the more imaginative battlefield strategies of the war. Whilst Manchester would stay on Clay Hill and mount a diversionary attack the following morning, a large force under Waller would skirt around the Royalist position and attack from the west. In accordance with the plan, on the evening of the 26 October, Waller detached from the main army in order to mount an attack from the west. He took his own cavalry with him, Essex's force (cavalry under Balfour and infantry) plus Manchester's horse (under Cromwell). In the Royalist camp however Prince Maurice correctly anticipated the Parliamentary move and turned his forces about and started digging in around the village of Speen. The following morning, Manchester launched a diversionary attack on Shaw House (held by Sir George Lisle). It was supposed to be a feint to enable Waller to move into position unobserved but it failed on two counts. Firstly the Royalists were not misled as they had noticed the withdrawal of a significant portion of the Parliamentary forces (hence why Maurice dug in at Speen) and second the attack on Shaw House was pushed with too much vigour. What was supposed to be a diversionary attack turned into a full frontal assault on the well defended position costing many lives and exhausting Manchester's force. He was now unable to support a combined substantive attack in co-ordination with Waller in the west. Meanwhile Waller's assault force had been harassed by Royalist attackers as they crossed the River Lambourn at Boxford and remained under periodic attack thereafter. Accordingly it was 2pm before they were in position to the west of Speen and, as the enclosed fields and narrow lanes hampered their deployment, it was much later in the afternoon before they were ready to attack. When they did so, the Parliamentary cavalry immediately ran into difficulties. Cromwell on the left struggled to negotiate the enclosed fields and was charged first by the Earl of Cleveland and then broken by Lord Goring. The situation was even worse on the Parliament right; Balfour was also struggling with the terrain and was charged by Bennet whose position on the open fields enabled him to mount a traditional and effective attack. On both flanks the Parliamentary cavalry had been defeated. Concurrent with the cavalry battle, Waller sent his infantry forward and here the Parliamentarians had more success. 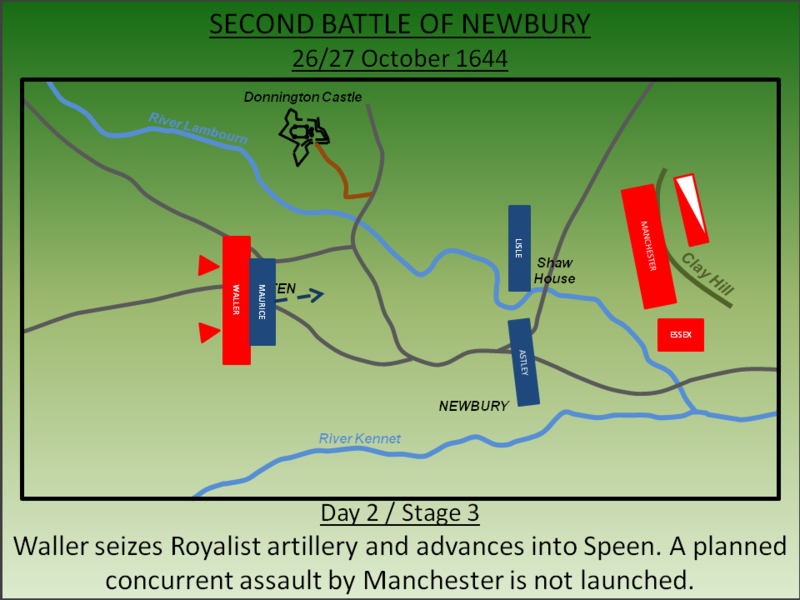 Under Skippon, the infantry advanced and quickly dislodged Maurice's force with fighting continuing through the streets of Speen capturing Royalist artillery as they advanced. Of note these were originally Parliamentary cannons captured by the Royalists at the earlier Battle of Lostwithiel (1644). 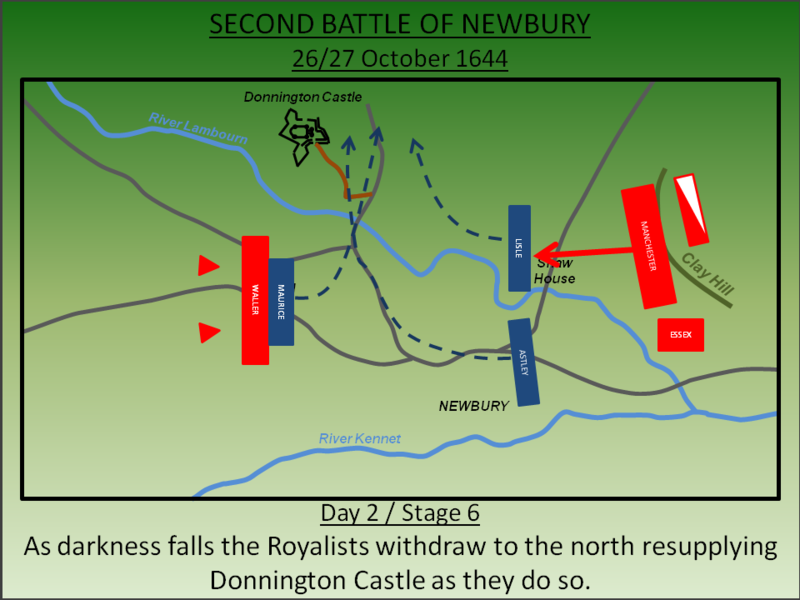 The success of the Parliamentary infantry came to a shuddering halt when they came under fierce fire from Donnington Castle. The situation on the western side of the battlefield could have been mitigated by a timely coordinated attack, as had been planned, by the eastern forces under Manchester. However the Earl's view of the field was hampered by low cloud and he did not move probably due to his forces being exhausted after the extended attack on Shaw House earlier that day. 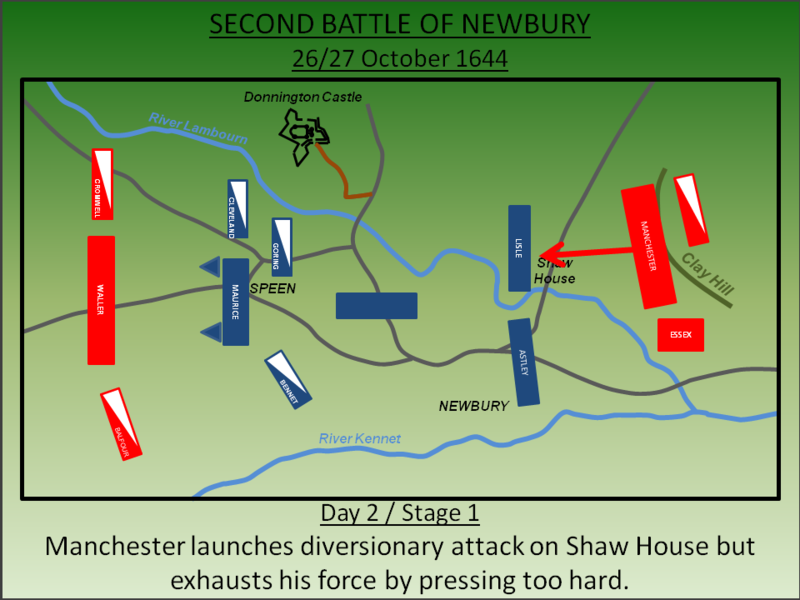 It took the bulk of the day for Manchester's force to recover from the attack on Shaw House that morning and it was not until dusk that he was able to rally his forces. Once again he attacked the Royalist defenders at Shaw House but by then it was too late; Waller's attack in the west had long since stalled and failed. As with the earlier attack, Manchester made little progress against Shaw House; Lisle led his forces to repulse the assault and, as darkness approached, the fighting across the battlefield died down. Under the cover of night the Royalists, noting they were heavily outnumbered, withdrew across the River Lambourn leaving their guns at Donnington Castle. Overall casualties from the battle were around 2,000 killed/wounded for Parliament and 1,500 for the Royalists. The greater numbers of the Parliamentary force had ensured it was them, rather than the King, who remained on the field in the wake of the battle. 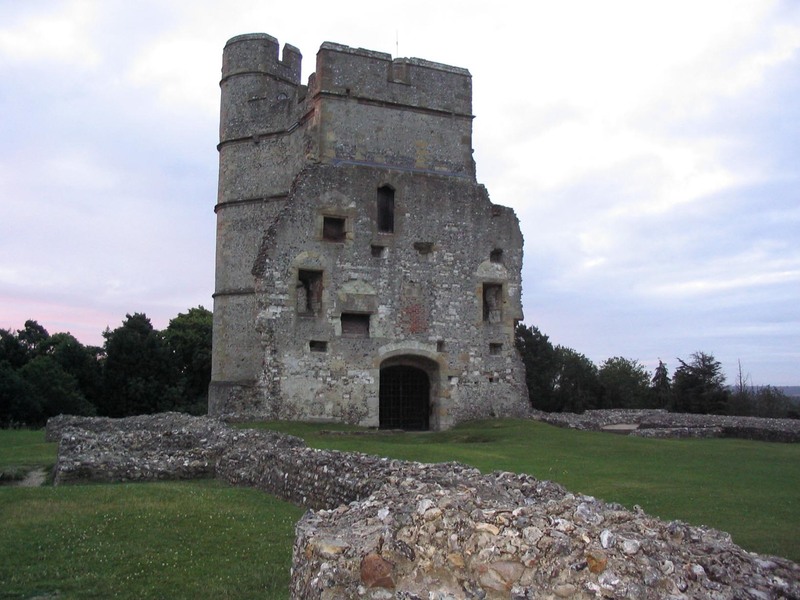 But the King's objective of relieving Donnington Castle had been achieved and the Royalist army had escaped unscathed. More significantly the combined forces of the three armies - that of Manchester, Waller and Essex - was hampered by the competing interests and political aspirations of the three Generals. In the bickering and political fighting that followed the battle, the Self Denying Ordnance was passed (see below); legislation barring individuals from being a Member of Parliament and holding military rank. In one stroke the army would now be commanded by professional soldiers rather than the nobility. Furthermore the army was re-configured based on a new model of a single fighting force with defined regimental sizes, a standardised uniform and fixed musket/pike ratio. 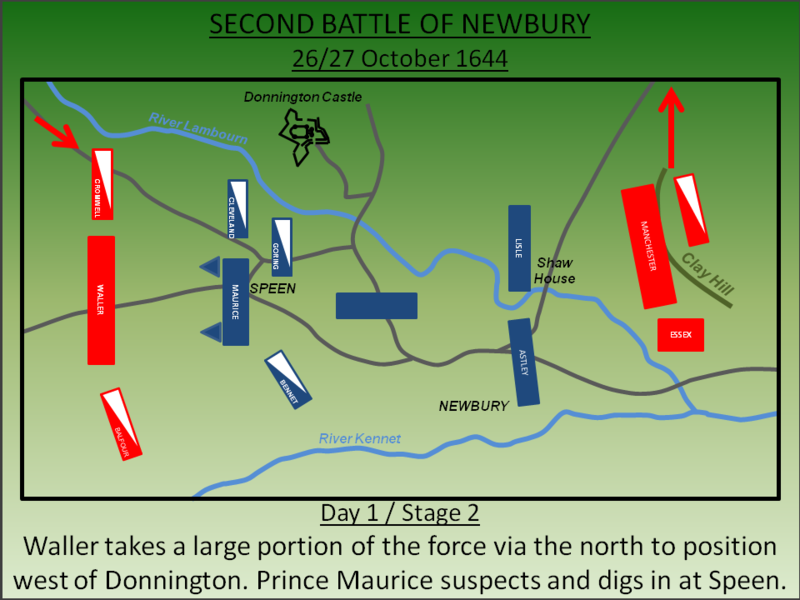 This 'New Model Army' was the most significant outcome of the Second Battle of Newbury and eight months later would see action at Naseby. 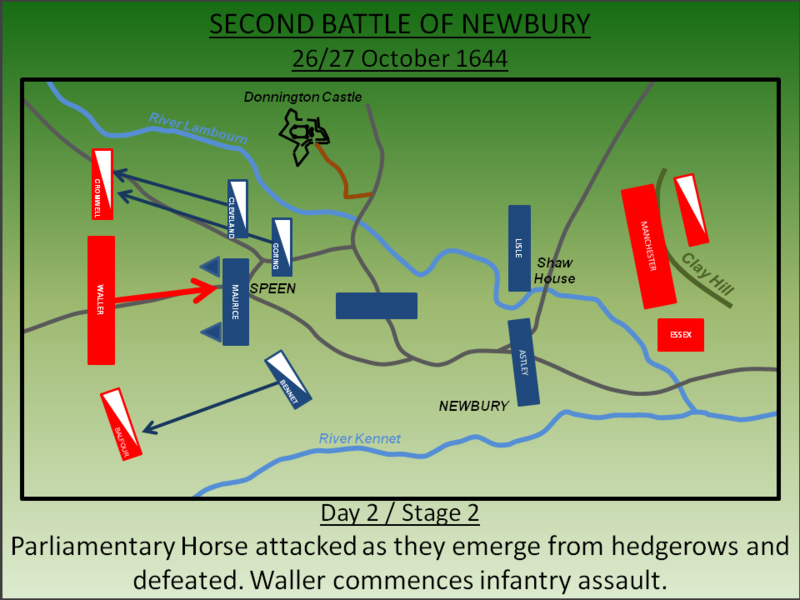 Following the Second Battle of Newbury it became clear the command and control of the Parliamentary armies had become untenable. When the three armies of the Earls of Manchester and Essex plus that of Sir William Waller were merged, the competing leaders squabbled and only became partially functional when they formed a ‘council of equals’. Just weeks after the battle the issue came to a head when the Earl of Manchester criticised the conduct of his second-in-command, Oliver Cromwell. There was some justification as Cromwell had been roundly defeated at Donnington but the motivation for criticism was religious/political; Manchester supported the Presbyterian church whereas Cromwell was an Independent. Cromwell defended himself by proposing the self denying ordnance; a measure whereby everyone should deny private ambitions for the public good. This manifested itself into legislation barring anyone from military office and Parliament. This hit the nobility – Manchester and Essex in particular – as there was no mechanism or ability for them to resign from the House of Lords. By contrast the MPs of the House of Commons could resign (although Cromwell would by-pass this legislation by a series of temporary commissions). In one stroke the nobility lost control of the army paving the way for professional soldiers such as Sir Thomas Fairfax and Oliver Cromwell himself to command the army. The new command would be tested at Naseby the following year. 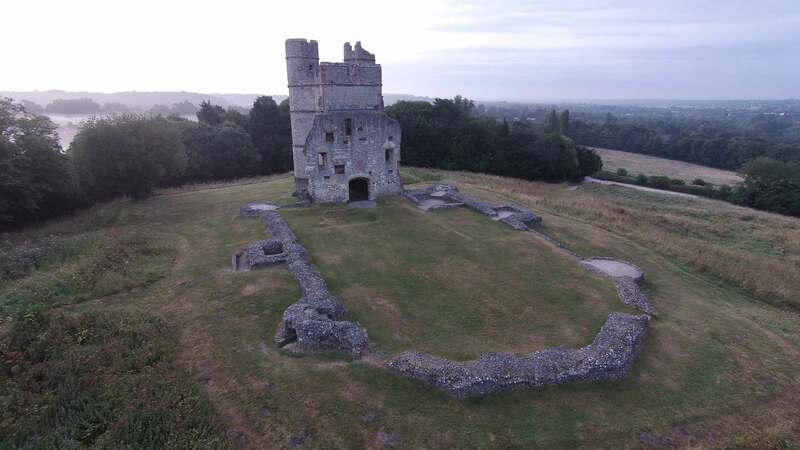 Donnington Castle should be the focus of any visit to the battlefield. This was demolished after the war but the Gatehouse survives as do the earthworks dug around the castle during the civil war. From the castle the landscape of the battle can be appreciated. Speen is now extensively developed. Donnington Castle. Sir Richard Abberbury the Elder, chamberlain to the English Queen and a resident of Berkshire and Oxfordshire, was given permission to convert his existing manor house in Donnington into a castle by Richard II in 1386. Well situated upon a hill overlooking Newbury and the River Lambourne the design was undoubtedly heavily influenced by the existing structure. 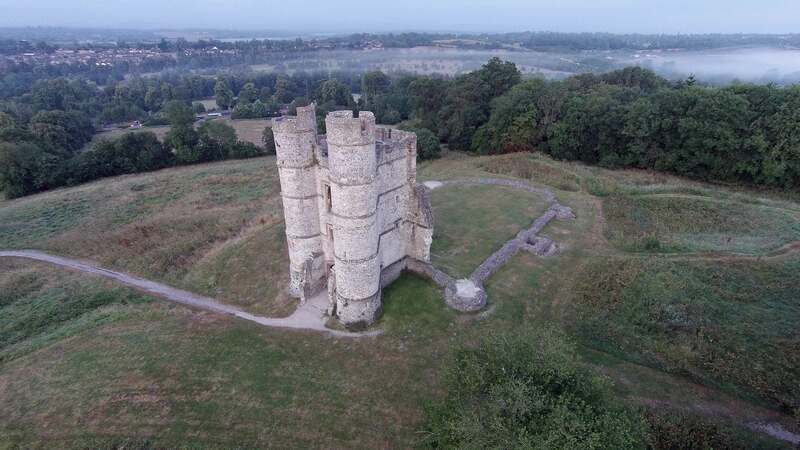 Built as a small rectangular castle with round towers at each corner and a further square turret on the North and South curtain walls it also had a single, but very impressive, twin-towered gatehouse constructed on the Eastern side. View to the south of Donnington Castle on which ground the Second Battle of Newbury was fought. The castle is found to the north of Donnington and is sign-posted. There is a dedicated car park but note access is automatically barred by an electronic gate that closes at 7pm and doesn’t re-open until 7am. Pedestrian access is possible outside these times but car parking elsewhere is difficult.